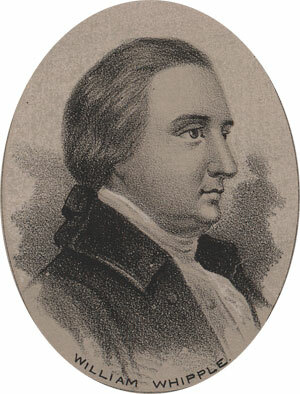 William Whipple was born at Kittery Maine, in 1730. He was educated at a common school until his early teens, when he went off to sea to find his fortune. He was an able seaman, earning the position of Ship’s Master by the age of 21. He worked hard and amassed a great deal of money. In 1759 he landed in Portsmouth and, in partnership with his brother, established himself as a merchant. Calls to public duty began almost immediately. He was elected to several local offices and was involved in the Patriot movement.